It snowed like CRAZY here in NYC last night, so I’m hoping I can tempt the warm weather gods back with this post! Can anyone tell me what the above is? Well, it’s an ice cream sandwich of course – DUH. So yeah, the ice cream sandwich in Singapore is a little different from what you may be used to. Don’t let that scare you – despite the Dayglo tint, the bread tastes like typical white bread. 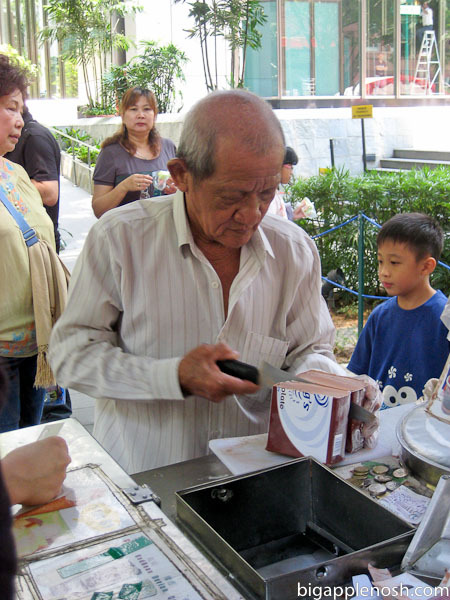 Ice cream is one of the few foods that can still be sold from carts on the streets of Singapore. The rest of the foodservice industry is highly regulated. Almost all of the ice cream carts are manned by older gentleman, and the wait for a sandwich can be long! It sure is worth it though. Hey lady, you’ve already got a popsicle – why are you in line again? An ice cream sandwich made with actual bread may sound totally weird, but trust me – it is awesome! I’d like to make this at home, but I wonder if there’s something special about that bread that yields different results. I guess I’ll just leave it to the pros for my sweet corn ice cream fix. Mmmm. 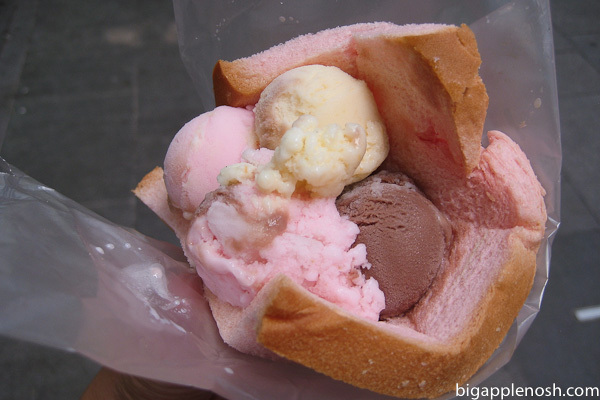 Ice cream sandwiches on real bread? Craziness! I want to try one . . . are there specialty shops in New York where you can get the bread? Oh my gosh! That looks so delicious! I want to try one! huuh, that looks pretty tasty. i like the magical looking bread! 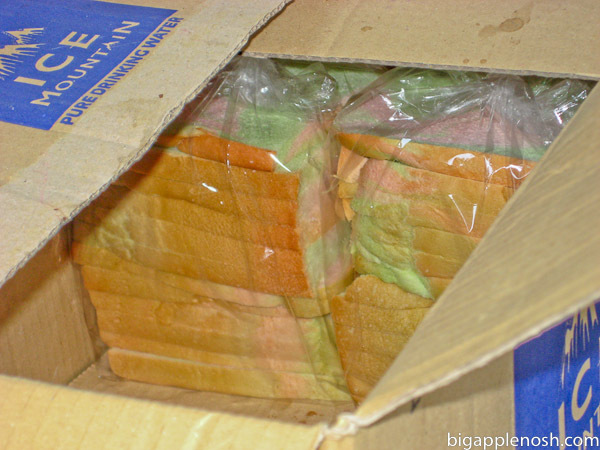 My brother had one with chocolate but the scoop was still Durian flavored – bleh! sounds delicious! i can see how the bread would be good because it won't break like a cookie would. so convenient! That looks delish! Usually Tokyo is pretty good at adopting food from Singapore, Hong Kong, Shanghai, etc. and making it into a huge trend, but I've never seen anything like that! oh yummy. all those flavors look wonderful. ESPECIALLY durian! That's so interesting and YUMMY sounding! 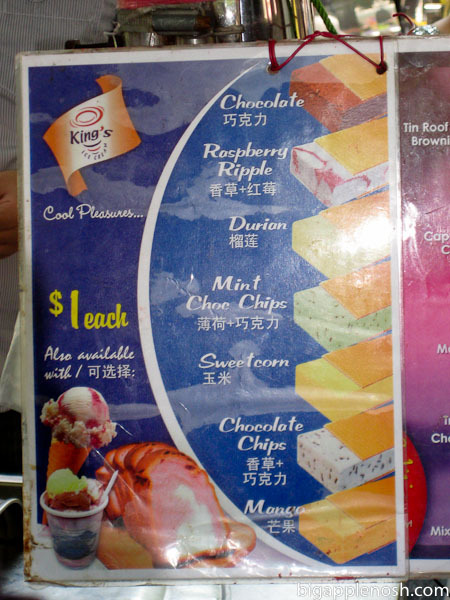 OMG, sweet corn ice cream sounds amazing. I saw that on Orchard Rd and was afraid to try it. Now I am kicking myself! Totally want to try that! Maybe potato bread would work? @Kim, I haven't found that bread here, but if I do you can be sure I'll post about it! That is pretty cool!! Italian bread may be pretty good too. ps love the color of the bread. pink makes me smile! 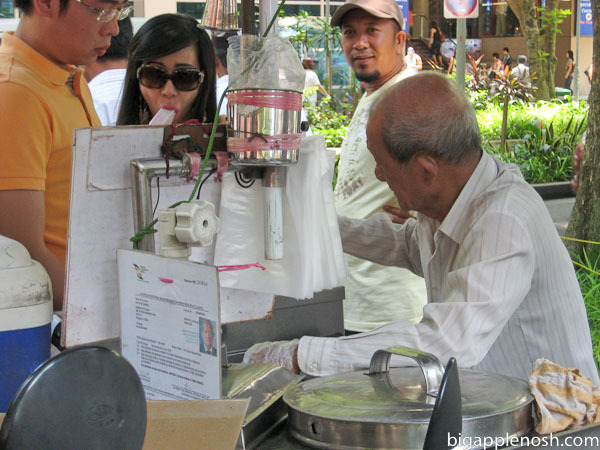 I am not a durian fan either–blech! I think you can buy bread like this at Ranch 99 or Goldilocks? I've never heard of that – it looks like it'd taste terrible! But I have been surprised by delicious combos before. I can imagine the bread to be like cake, it must be delicious! looks yum. I bet it tastes good!